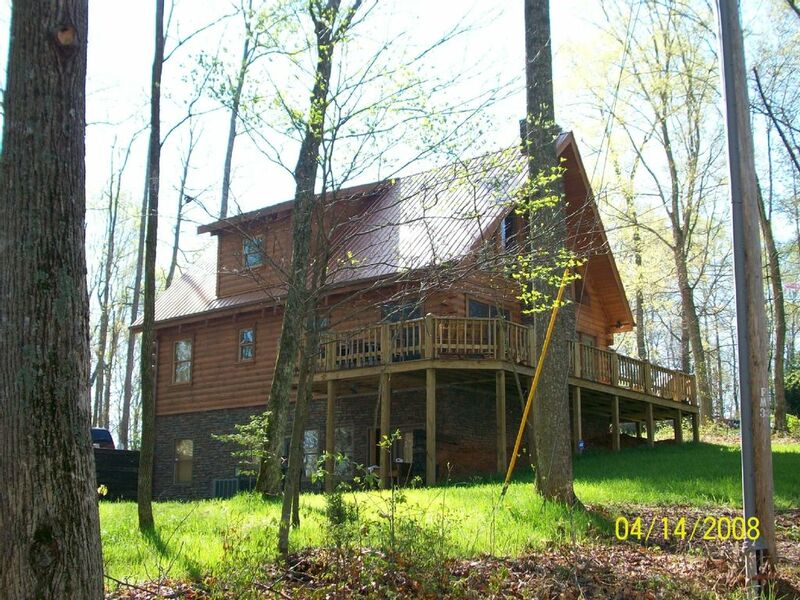 Beautiful newer log home overlooking Dale Hollow Lake, 1/2 mile to Eagle Cove Marina boat dock and 2 launch ramps. 5 bedrooms, 3 full baths (sleeps 11 - 13), great room with flat panel TV over fireplace, kitchen/dining area, recreation room with TV, ping pong table, foldout queen sofa, wraparound deck w/outside dining, gas grill, fully stocked kitchen, bring only food and drink... circular drive with spacious parking for boats and cars. What To Do: Great water sports, hiking, biking, fishing..State parks close by..very quite and secluded, but not remote. This is our vacation home and it is set up to 'COOK'! You will only need to bring your food and drink...everything else is there..great wrap around deck with SS gas grille and outdoor eating for 6 on the deck + chairs. We did not cut any corners building this home..Granite Tops and polished hardwood floors throughout..bottom floor is southwest tile, 2 BR, 1 Bath, Rec room, large laundry room....Main floor, 2 BR, 1 Bath, Den, Fully stocked Kitchen..Top floor, 1 BR, 1 Bath, seating area, extra child's bed. Owner of Americas Marine Sales since 1985, we work in the boating Industry as Manufactures Reps covering the Southeast and Southwest states for Avalon Pontoons, Blackjack/Frontier Bay Boats, Falcon Bass Boats, Excel Alum Boats and Magic Tilt trailers. WE have fished and boated on Dale Hollow for years. With the warm, clear and clean waters, I knew it was the place to build our vacation Home. No big city crowds like Center Hill Lake. Peace and quite, very secluded, lots of trees. Only 1/2 mile to Eagle Cove Marina with 2 Boat ramps. They rent pontoon boats, PWC, fishing boats and ski boats. Short term slip rental is available, large parking area at the marina for boat trailers. All Stainless and Granite Tops thru out the house. Great wrap around deck with outdoor table, seats 6. Rentals at Eagle Cove Marina, 1/2 mile away. Contact us about your dog...NO Cats..Pet deposit $100, non refundable. Smoking in this home will forfeit your $500 security deposit. We thoroughly enjoyed our long weekend! Each adult had their own bedroom and all were comfortable. The WIFI was good, plenty of firewood for the weekend, the frig was big, enjoyable lovely wrap around deck, and a new grill for steaks - what is not to love. Very minor note that we had wished that kitchen had a place to store all the non-refrigerated food we brought - besides kitchen countertop. But that in no way detracted from a lovely stay. Owner is great to work with. Thanks GB! My family and I really enjoyed our stay. The house was very clean and the owner was super easy to work with. Thank you so much! Thanks for the 5 star review and for leaving the home so spotless, please come back. We stayed here for the Christmas holiday and had an amazing time. The home is beautiful, the area is quiet and the scenery is perfect. The home had a Christmas tree and lights/decorations up. The owner had firewood delivered to the home for our use. We brought our own kitchen items to use but the house is well stocked with anything you would need. There was plenty of room for our large group. The heat didn’t circulate too well to the basement and the pull out couch downstairs was uncomfortable to sleep on. Other than that we certainly enjoyed our stay and would definitely go back. GB is a great host and was very helpful and responsive. Thank you again for opening your home to us. Our first cabin trip was a success! Thanks Guys, hope Christmas was good to you. Also thanks for leaving the home spotless. New sofa/love seat and pullout couch on order. Beautiful hilltop view for the winter. Just a minute from the water in the summer. Cozy, spacious, clean, elegant. Loved the fireplace that was stocked with good wood that is ready to burn. Nice wrap around porch. Large High class televisions for football and thanksgiving day parades! Definitely recommend! Thank you Guys, glad you had a good time, WOW did you ever leave the place so clean. Our cleaning lady gave you an A+. We had a great time! The house was very nice and fully stocked for use. Plenty of comfortable beds and cozy wood burning fireplace with plenty of wood to burn. The kids enjoyed the ping pong table and watching movies. Please come back...GB and Bev.. Terrific Dale Hollow Lake Home! We stayed at this home over Labor Day weekend with a large group of people. The home comfortably slept our entire group of 12 people, and came with ALL the bells and whistles! Kitchen had every pot, pan and dish necessary to cook anything. The main floor and basement living space were very spacious, giving our large group enough room to spread out for movies and games. The home is located very close to a great marina with boat rental! Located on Dale Hollow Lake, great boating, water sports, fishing (world record small mouth bass) swimming, hiking trails. Home is 1/2 mile from Eagle Cove Marina, pontoon boat and personal watercraft rentals, 2 ramps..one of the top marinas on the lake. Our home has a large circle drive for boats and cars...you do not have to park on the street. An easy drive from Cookeville on Highway 111 running north from I-40E. Also easy drive from Kentucky. Byrdstown is about 1 hour from Historic Jamestown and Rugby TN. Nearby Cordell Hull State Park and Standing Stone State Park have hiking and other activities. $300 deposit to book, balance due 30 days prior to check in date. 100% deposit refund if cancelled 30 days prior to check in.